If a dog daycare in NKY is what you’re looking for, then we may be exactly what you want for your furry family member! 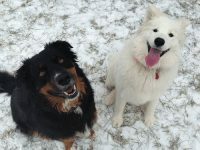 Doggie Daycare friends Cody and Sophie would love you to check out our informative doggie daycare video. New Beginnings is not a traditional dog kennel or dog daycare. We strive to give each individual dog what’s needed according to temperament, age, size, health and behavioral factors. That’s part of the reason we’re able to integrate most dogs, even those who haven’t been successful in doggie daycare elsewhere, into our program. We take the time to meet newbies or nervous Nellies, and introduce them to the grounds, the team, the daycare & boarding associates, and one new friend at a time. Dog fights do not have to be part of the culture of an off leash play facility and are not accepted as part of our culture. We use only positive reinforcement and no force leadership practices in all of our programs. Unlike other business in doggy daycare, we do not employ the common practice of utilizing shock collars in our off leash play programs as a method of controlling the dogs, nor as a method of bark control. We are closed indeterminately due to a family emergency.